Postpartum weight loss begins – it's a mums word.. Okay okay, so I posted about this a few weeks back and after a couple of days of eating well and losing a couple of pounds over a couple of weeks, I gave up and my diet has become out of control. There’s a couple of reasons for this.. Firstly, breastfeeding makes me super super hungry ALL of the time. I must consume so much in a day. And secondly, I am so so busy with the boys that I just grab convieniant snacks all day as I don’t get to sit down to eat a meal until dinner. (I still have three meals they are just rushed and whilst hovering over my toddlers highchair when he has his meals). The result is I don’t just grab any snack, I go for complete and utter junk as I just need energy. I’m actually feeling sick thinking about the amount of crisps, cake, chocolate and biscuits I eat daily! I’m starting to feel really lethargic and not great in myself, which certainly is made worse by the lack of sleep I am getting. And, all of this junk is not good for my breastfed baby. so this time I really mean it when I say I am going to start a healthier diet.. and hope to lose some weight in the process although I won’t be calorie counting or starving myself, as after all I am breastfeeding. So to motivate me (seeing as my weekly outfit posts have motivated me to get out of my leggings and t shirts).. 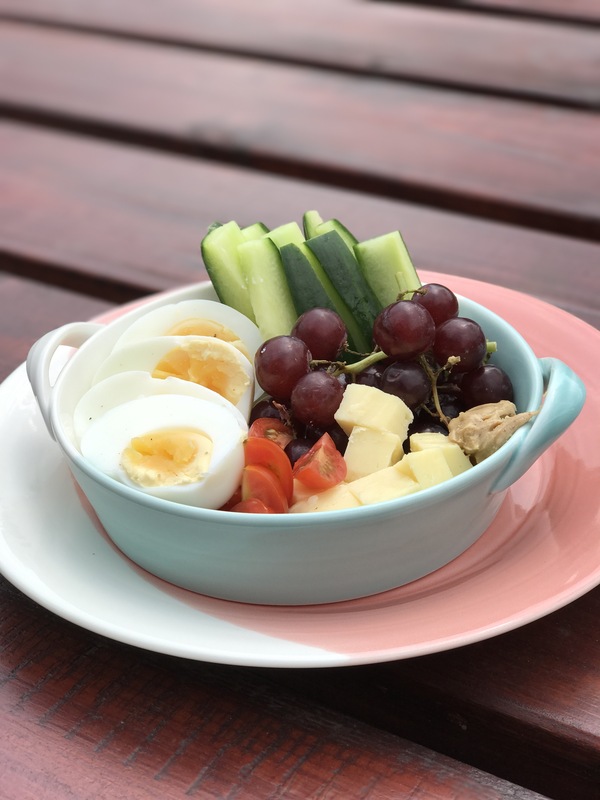 I am going to update you all with some healthy meals I am eating and my postpartum weight loss journey. Cut out the crisps, chocolate, cakes, fizzy drinks! 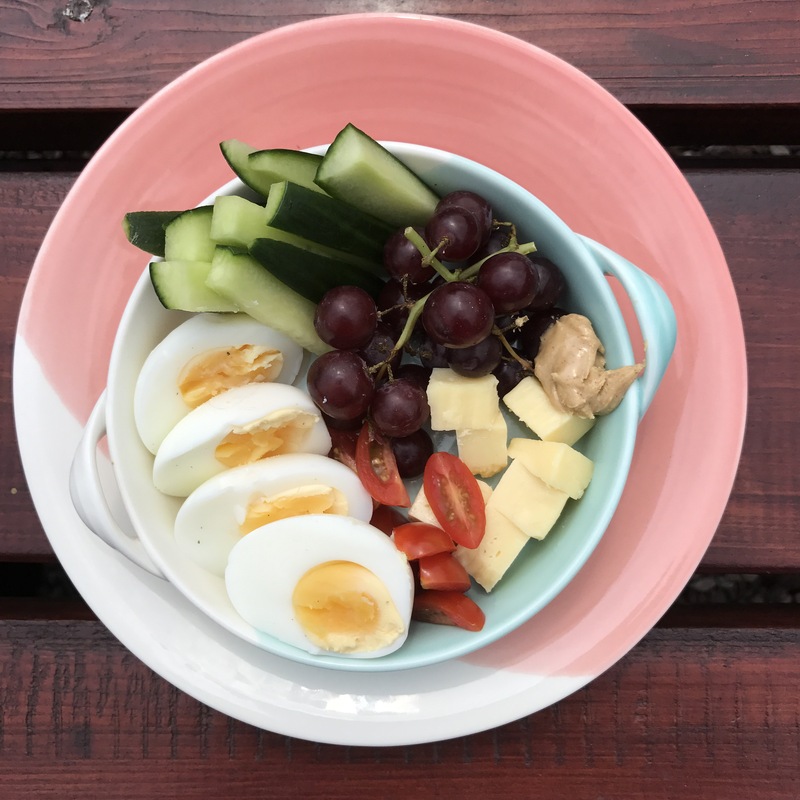 So day one this is what I had for lunch.. there was no cooking involved, unless you count boiling an egg.. but my toddler was at nursery so I had the time to think and make this.. In total this came to 400 calories and had 22.8g of Fat, 23.8g of carbs and 22.2g of protein… As I said, I am not calorie counting but I’ve included this for anyone who is interested. Let’s hope tommorrow when I’m home alone with both babies I still manage to keep this up! Wish me luck!